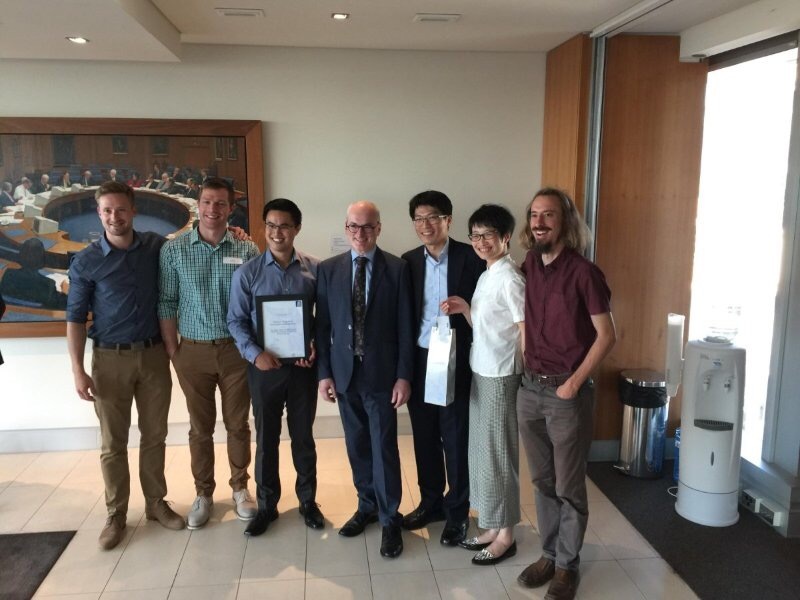 A HealthTech startup with global potential launched at the University of Melbourne has just won the 2017 HealthTech Innovation Challenge and is set to revolutionise stroke rehabilitation through an innovative robot. Founded by an entrepreneurial team from the Wade Institute in collaboration with Translating Research at Melbourne (TRaM), ReCubit has developed a world-first engineering technology using shipping technology principles that enables critical upper limb rehabilitation for stroke patients in hospital or home settings. Recubit team member, engineer and recent Master of Entrepreneurship graduate Andrew Rowse says: “It is fascinating to be able to take technological principals that have been utilised in ships for hundreds of years, and apply them to an area such as stroke therapy. Approximately 475,000 people across Australia are currently living with the debilitating effects of stroke, and every 9 minutes an Australian’s life is changed forever with the impact of stroke. Most stroke patients never recover enough mobility or dexterity to perform basic daily tasks, and this is attributable to the fact that they do not receive enough therapy during their post- stroke recovery phase due to therapists being physically limited in the amount of care they can provide on a one-to-one patient ratio. Recubit team member and Master of Entrepreneurship Graduate Maarten Van Gorp also holds a Master of Physiotherapy from Belgium, so understands the clinical need for a product like this. “Physio, like entrepreneurship, is all about clinical reasoning and thinking,” he said. The ReCubit prototype device is currently being trialled in Melbourne hospitals, and has strong potential commercial application in the healthcare sector due to its ease of use, affordability and portability, including in home-based care applications. On Monday 20 November 2017, they won $20,000 at the 2017 HealthTech Innovation Challenge from the Graeme Clarke Institute for Biomedical Engineering. This will enable the Recubit team to accelerate their go to market strategy with further research and development trials (pictured below – photo courtesy of Lauren Sosdian). The potential export market for this home-grown HealthTech product is huge, with stroke incidence recorded at every 40 seconds in the US (800,000 stroke occurrences annually, 2200 per day), and globally an estimated 15 million people suffering stroke (of which 5 million die annually). Stroke is currently the leading cause of long-term disability according to a recent report by the US Centres For Disease Control and Prevention. Automation devices like this provide a strong proof point for how Victoria can successfully collaborate and commercialise research to bring technological health innovations to the world. Victoria is uniquely positioned as a HealthTech hub, as it is home to one of the world’s largest biotechnology and research clusters, consisting of global and local companies known for their excellence and ability to produce outstanding world-class products. The Recubit team is testament to Victoria’s growing startup ecosystem that is reliant on diversity of teams to seed the startups that can, with the right ideas, markets and funding, successfully commercialise and scale their products and services around the world. The ReCubit team is already kicking big goals, having been accepted as a national finalist in the prestigious Medtech’s Got Talent competition in Melbourne on November 30, and recently pitching their startup to a panel of high-profile investors at the University of Melbourne’s Wade Institute Showcase Pitch Night where they took out the MYOB People’s Choice Award and received strong commendation from judge Shane Galligan of Credit Suisse.